Susan Warren from the Lakes and Ponds Section of the Vermont Agency of Natural Resources is looking for input from people interested in the health of Vermont lakes and ponds in reference to ACT 138. Please review the following information about the current status of lakeshores in Vermont. Strategies for building support for improved lakeshore protection. Vermont lakes are threatened by excessive shoreland clearing and lawns to the water’s edge. When a lake’s natural vegetation (woodlands) is removed and replaced by lawns and impervious surfaces, aquatic habitat degrades, shores erode, and the lake is more vulnerable to water quality problems such as blue-green algae blooms. The science is clear that naturally vegetated shores protect lakes’ water quality, ecology, and bank stability; and healthy lakes benefit people’s use and enjoyment of the lakes, property values, as well as our vital tourism economy. However, increasingly, new development or redevelopment on Vermont lakeshores involves nearly complete removal of the native vegetation. There are a few tools currently available to protect Vermont lakeshores, including education, outreach and technical assistance, municipal zoning (only about 20% of towns have standards that protect lakes), and Act 250 (only a minor amount of shoreland development is covered). Additionally, some shoreland is protected through land conservation projects such as those through a land trust. According to a US EPA study of lake conditions across the country, Vermont’s lakes rank worse than both the northeast region and the national average in terms of percent of shoreland that is either in fair or poor condition (as measured by the extent of clearing and lawns near the shoreline). VTANR plans to use this study to clearly lay out the shoreland and lake protection choices before Vermonters. Thirty years of lake monitoring and assessment, including a new study linking cleared shorelands with degraded lake habitat, leave little doubt that healthy lakeshores are critical for healthy lakes. Healthy lakes are essential to our state’s long-term prosperity, both in terms of the economy and environmental sustainability. Did you know? Only a small percentage of shoreland development is reviewed by either a state program or a municipality to ensure lake-friendly development is practiced. 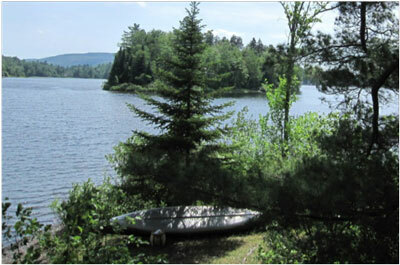 Lakeshore disturbance (removal of natural vegetation) is the most serious stressor on Vermont lakes, threatening water quality, in-lake habitat and shoreline stability. Of the 203 Vermont lakes assessed for shoreland condition, 24% are in either “fair” condition or “reduced” condition, significantly more than those affected by phosphorus pollution and invasive species combined. There is a strong link between lake water quality and surrounding property values. The majority of lakeshore erosion that occurred during the Lake Champlain spring floods of 2011 occurred where trees and shrubs had been removed and replaced with grass or lawn. 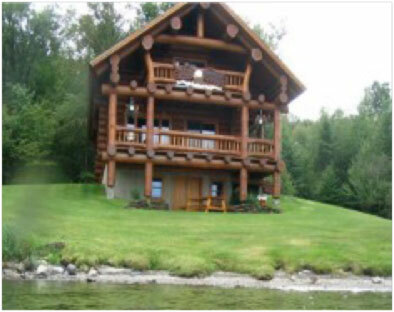 It is possible to develop a lakeshore property and enjoy the lake in a lake-friendly way! Lake-friendly shoreland development At this shoreland home, the shore has been left in native trees and shrubs, and the clearing for a lawn is set further back from the lake.